As a cyclist, he’s looking for a ride to the office that is safe and smooth — as well as enjoyable and convenient. He rides different routes, uses dedicated bike lanes and takes advantage of “road diets,” a concept that reduces the number of vehicle lanes or narrows them to provide safety and room for other users, on some midtown streets. Day by day on his three-mile jaunts, McKeever, 56, notices changes that hint at Sacramento’s cycling future. Notably, he sees more bike commuters on the road now than when he began riding to work two years ago. McKeever says Sacramento is “on the cusp” of that transformation. Plenty of challenges exist to what some planners and cyclists see as Sacramento’s emergence as a region that embraces cycling. Funding limitations, physical barriers and competing priorities stand between the Capital Region and its aspirations to join the likes of Minneapolis or Portland, Ore., as mid-sized cities with well-earned biking reputations. Nearly 6 percent of Portland’s population regularly commuted by bike in 2009, followed by Minneapolis with 4.3 percent and Seattle with 2.9 percent, based on a League of American Bicyclists ranking of the nation’s 70 largest communities. Sacramento ranked 11th with a little more than 2 percent of commutes made by bike, down from 2.7 percent in 2008, when it ranked fourth, but up from 1.3 percent in 2006. Sacramento has 279 miles of on-street bike lanes and 82 miles of off-street bike paths, according to Sacramento Area Bicycle Advocates, up from 200 miles of on-street lanes and 60 miles of off-street lanes in 2006. Local planners say they hope to add to those totals and make the routes safer as a better, more efficient cycling transportation network emerges. 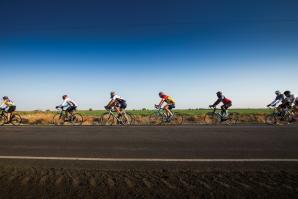 Several interests seek to influence the ultimate contours of Sacramento’s cycling panorama. SACOG’s Regional Bicycle, Pedestrian and Trails Master Plan, updated in June, features more than 1,500 projects. Its goals include doubling the percentage of trips by cyclists and pedestrians from 6.6 percent in 2000 to 13.2 percent in 2020 and reducing by 20 percent the number of cyclists and pedestrians killed or injured in traffic accidents. The bicycle advocates group is putting together its own cycling transportation blueprint, a plan meant to focus on 20 to 40 projects that could make the biggest difference in the region. Regional cooperation with SACOG has been good, participants say, but local governments have their own plans, too. Individual cyclists also have opinions about how cycling planning should proceed. Funding always is an issue, especially in an era of budget cuts. Through 2035, SACOG is planning $3 billion in spending for cycling and pedestrian projects plus $595 million for rehabilitation work out of its projected $36 billion budget, according to Matt Carpenter, SACOG’s Director of Transportation Services. SACOG, which taps federal and state funding, last year awarded a total of $8.6 million to 12 local cycling/pedestrian projects. In Sacramento County, Measure A funds contributed $2.9 million to cycling/pedestrian projects in the past fiscal year, the Sacramento Transportation Authority reports. In addition, Assembly Bill 147, which seeks to expand eligible uses for transportation mitigation impact fees for transit, bicycle and pedestrian facilities, is awaiting Gov. Brown’s signature. Currently, the use of transportation mitigation impact fees is limited to bridges and major thoroughfares, so a jurisdiction cannot use them to add or widen roads to support new projects. AB 147 would allow a city or county to use these fees to add or improve transit facilities such as bicycle lanes and pedestrian paths. With multiple parties involved, visions of how the region’s bicycling system should look vary, but they are bound by common threads: Connectivity. Safety. Education. SACOG’s McKeever says creating more connections is critical. Sacramento is nearing completion of a bicycle/pedestrian overpass spanning Interstate 80 to connect North and South Natomas. Tricia Hedahl, executive director of Sacramento Area Bicycle Advocates (SABA), says she dreams of putting Eastern Avenue on a road diet, making it easier for riders to connect to the American River Parkway bike trail. Ed Cox, the city of Sacramento’s bicycle and pedestrian coordinator, talks of plans for a bridge connecting Curtis Park to Sacramento City College and light-rail. Sacramento cyclist Jeffery Rosenhall, 38, bicycle commutes four miles to work, from Tahoe Park to midtown, and envisions a network of well-promoted cycling routes. “If they wanted to go downtown, they’d have a route publicized as a safe route. If they wanted to get to the American River Parkway or wanted to get to (Sacramento) State, there’s a system of bicycle-friendly routes that connect different parts of the city,” says Rosenhall, a community specialist for the California Department of Health, envisioning an ideal setup. Consistent vertical signage and strong branding that alerts the public to recommended cycling routes are necessary amenities for a first-class cycling city, Rosenhall says. Lauren Michele, owner of Policy in Motion, focuses on climate policy analysis, education and implementation relative to transportation and land-use projects. She desires improved connections within communities and says she supports Safe Routes For All, a grassroots movement to integrate schools with transportation planning. But safety is a critical concern. Two recent fatalities on Carlson Drive near Sacramento State — one at J Street, the other a block away at H Street — have prompted Sacramento Area Bicycle Advocates to focus on the Carlson corridor even though it’s not in SACOG’s master plan. Attention to that area also could improve connections to M Street, a wide, residential street — far less busy than H and J streets — that long has been a preferred route through east Sacramento. Cox, the city of Sacramento’s bike and pedestrian expert, says concerns about the Carlson corridor are valid, but he would not label it a priority. Safety can be improved in ways other than expanding routes and making physical changes to existing ones, some experts contend. Rosenhall, the Tahoe Park bike commuter, agrees. A certified bike instructor who teaches adult rider safety, he says cutting speeds and traffic volume — and utilizing designated lanes — make a difference. His perspective is influenced in large part by rides he takes with his 3-year-old son. And for “everyone else,” safety is a top priority, says Chris Dougherty, a city of Sacramento planner and SABA board member. “If we’re really trying to overcome the hurdles of getting more people on bikes, we need to do a lot more on infrastructure to encourage people and make them feel as safe as possible,” he says. Dougherty commutes 20 miles round trip from Land Park to the Northgate/Del Paso area. He supports making changes to J Street, which is a heavily traveled east-west thoroughfare beginning in the heart of downtown and ending where it becomes Fair Oaks Boulevard near Sacramento State. Instead of three lanes of auto traffic — which characterizes the street until it reaches east Sacramento — he envisions two, leaving room for a “cycle track,” a 6-foot bike lane between parked cars and the sidewalk. Portland has had success using cycle tracks as part of its transportation system. “What it does is it creates a buffer,” Dougherty says, before characterizing city cycling as “downright dangerous.” “That would be a good way to tackle good, safe infrastructure on some of the higher-volume streets. Experts and enthusiasts don’t look far for another potential solution, pointing to quieter streets running parallel to busier arteries as ideal bike routes. Yet, the need for cyclists and motorists to coexist is clear, and Cox of the city of Sacramento says cyclists must be educated about practical and lawful rules of the road. Cox also noted a pressing need for children to wear helmets when riding and to learn cycling etiquette. “When kids are, like, 12, 13, 14, their parents get the impression they know enough about biking; ‘Go ahead and ride in the street,’ “ he says. What can Sacramento learn from other mid-sized cities? Minneapolis offers 84 miles of off-street paths and 46 miles of on-street bikeways. That city has six funded bicycle boulevard corridors, areas where low-volume and slower-speed streets are made more cycling friendly through traffic calming, signage, pavement markings and intersection crossing treatments. The city is one of four nationwide to receive $21.5 million in federal funds through the Nonmotorized Transportation Pilot program, designed to increase bicycling and walking and reduce driving. Portland, meanwhile, is the only city among the nation’s 70 largest to receive platinum status from the League of American Bicyclists. The city boasts 324 miles of bikeways: 202 miles of bike lanes, 76 miles of off-street paths and 46 miles of neighborhood greenways. Those 324 miles cost less than $60 million, about what one mile of urban freeway costs, according to Dan Anderson, a spokesman for the Portland Bureau of Transportation. Another Portland feature, Sunday Parkways, features rides on closed streets through different neighborhoods each week. A recent ride through North Portland drew 31,600 cyclists, the Bureau of Transportation reports. 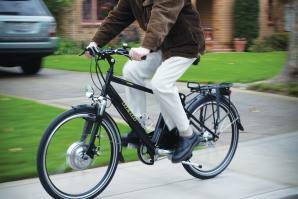 The city’s goal is to increase from 10 percent to 25 percent the amount of trips made by bike by 2030, Anderson says. Along with cycle tracks, Portland has “sharrows” — shared lane markings showing cyclists the best place to ride and reminding drivers to share the road — a feature Anderson says has helped. Can cycling become a part of mainstream transportation in the Sacramento region? Local planners and cyclists say we’re already there in areas such as midtown, downtown, Davis and Folsom. SACOG chief Mike McKeever says he expects reduced transportation funding will shift planners’ focus to smaller, yet beneficial, investments. The desired result, he says, is a region where cycling is a bigger, safer part of the transportation tapestry.